One of the biggest movers of golf ball distance is the great strides that have been made in using technology to analyse the golf swing. This not only enables coaches to understand what body positions and actions deliver the greatest benefits, but also enables them to quickly identify and illustrate to golfers what they are doing wrong and what they should be doing right. This results in quicker adoption of more powerful methods of hitting a golf ball. As devices and software improve and become more unbiquitos and cheaper, this technology is starting to enable the average golfer to easily analyse their own swing and monitor practice sessions to ensure that they improve quicker. One of the latest advances to cross our paths is the GolfSense 3D motion swing sensor. 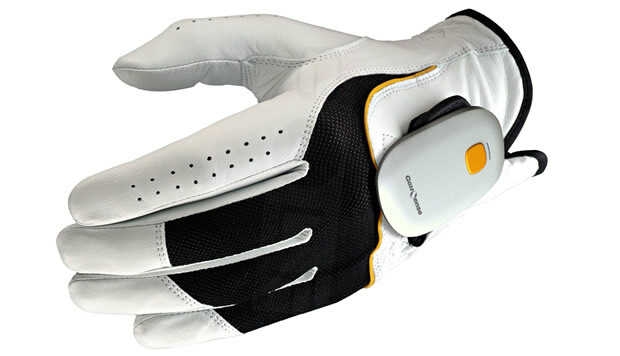 This clever bluetooth device easily clips on to the velcro strap of your golf glove and then works with a free app that can be downloaded to Apple and Android devices. You create an online account via the app and, once you have paired the sensor to the device, you swing away and the app records the swing path of your hands. The results are then displayed on the screen of the device to show you whether you are swinging in to out or vice versa. It also shows you data such as club head and hand speed, swing tempo and wrist rotation. If you use an iPhone you can also put the phone in your pocket as you swing to record your hip rotation too. The results are displayed using an animated figure on the screen that can be rotated 360 degrees so you can see your swing path in all it's glory from every angle. See the video below for more. The GolfSense 3D Motion Sensor was great fun and was ideal for use on the range, on the course or indoors as you do not have to hit a ball to measure a swing. There is a great option to only measure impact shots so you can practice swing without recording and only measure actual shots. Once you have downloaded the app, it is easy to configure the clubs to match your set and pair the GolfSense Sensor with your device. I first used it with an iPad and this was great for a range session. I just put the iPad near the practice mat and hit balls and it automatically went from recording one swing to another without the need to touch the iPad. After each swing it replayed the shot and also commented on the tempo of the swing. This was almost the best feature of the whole thing, as I was able to immediately adjust my tempo and the result was much better shots in a matter of a minutes. Replaying the swing plane was also interesting and from a slight out-to-in path I was able to work on dropping the club on the inside from the top of the swing and soon enough I had the feel of what an in-to-out swing path should feel like. I then decided to move to an iPhone and this is where the online account came in very useful. Your swing history is synced via the web so that you can transfer swing data from one device to another. Whilst you can compare 2 individual swings I would like to have seen the ability to compare all the swings on a given day or with a given club to get an overall average of swing speed, tempo and clubhead speed. However, this is controlled via the app so hopefully future versions will be released that will improve the analysis available. The advantage of the iPhone was that I can fit this size of device in my pocket to measure hip rotation. The only downside of this was that to view the tempo or information of the swing I had to take it out of the pocket after each swing so it was better to hit a number of shots and then analyse. There is a screen lock to prevent the app being opened in your pocket, but I found it unlocked itself too often in the pocket and then the swing was not recorded. The device will also record the geographical location of each shot so if you are using it on a course you can see where you used each club and how your swing tempo varies during a round. It is hard not to be impressed with the technology of the GolfSense sensor and the app. The swing path, club head speed and impact chart of how you release the club was all very good information to have. The clubhead speed for each club could be useful for fitting clubs as more manufacturers are quoting suggested speeds for different shaft flexes and head lofts. Having the hip turn information was also useful, but the issues I had getting the data almost made it not worth the effort. On the plus side, using the GolfSense to measure swing tempo was worth the price of the device in itself. And therein is the main issue with the GolfSense 3D Motion Sensor. It is a very clever piece of technology, but it is a little on the pricey side. However if tempo or swing plane is one of the things you have to work on then having a way to monitor your practice sessions you will probably save some of the cost on range balls by getting there quicker.